In-depth Report: IRAQ REPORT, SYRIA: NATOS NEXT WAR? This document was classified as “secret” and distributed to the Department of Homeland Security, the Department of State, the DIA, FBI, CIA, the Secretary of Defense, the Secretary of State, Central Command, and other agencies. It is an Intelligence Information Report, not a “finally evaluated intelligence” assessment, yet its information was vetted before distribution. 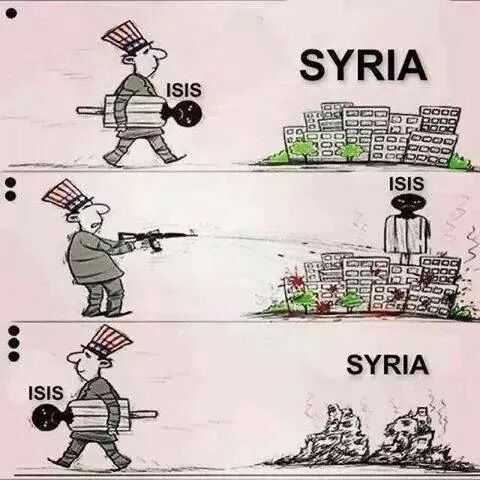 Therefore the US-led coalition that is now “fighting” ISIS continually supported an opposition it knew to be dominated by sectarian extremists, lying to the public while describing them instead as “moderates,” and predictably knew that this support would result in the establishment of an “Islamic State” and further continued to aid in such an establishment in order to weaken and oppose Assad and combat Iranian expansion. It is a tenant of law that the “doer of an act must be taken to have intended its natural and foreseeable consequences.”(1) Therefore, even absent the documents own admission of complicity of intent given that the rise of ISIS was a “natural and foreseeable consequence” of continually aiding the sectarian opposition the US and her allies must therefore be taken to have intended this outcome. Furthermore, the document specifically demarcating Iraq as a center for unwanted Iranian “Shia”expansion while accurately predicting the fall of both Mosul and Ramadi to Sunni extremists, thereby assuring against such an expansion, all lead to the conclusion that the recent ISIS gains in both of these cities was not something that the US opposed, but instead something that it desired. Given that the fall of Mosul and Ramadi too were “natural and foreseeable consequences”, given as well the severely questionable ways in which each city fell and the fact that although these outcomes were predictable the US-coalition still continued the policies that were known to lead to them, the US and her allies must therefore be taken to have intended these outcomes as well, either directly or indirectly. Mosul was simply given away to by a battle-hardened army of 350,000 men to a lightly armed brigade of roughly 1,300 Islamists(3), the commanding military officers specifically ordering their subordinates to leave their weapons for the jihadi’s and to flee. Had this “remarkable” fall been desired by the US-coalition in order to “isolate” the “strategic depth of Shia expansion” in Iraq? Or rather “Had the senior Iraqi commanders been instructed by their Western military advisers to hand over the city to the ISIS terrorists? Were they co-opted?” as Professor Michel Chossudovsky had asked when this occurred? Similarly, the more recent fall of Ramadi is equally as dubious. The US-led coalition, which had promised to defend Iraq against the Islamic State, basically allowed Ramadi to fall, conducting only 7 airstrikes during the battle, which is such a low number as to be completely irrelevant. The remarkably weak excuse was that a great sandstorm had prevented them from conducting regular attacks. This despite the fact that the next day ISIS was holding victory parades among perfectly clear skies, the militants assembling in massive rows down the wide open street.With no “sandstorm” excuse, airstrikes could have easily wiped out entire factions of the extremists the US is supposedly fighting, yet none occurred. Why? Had this too been desired by the US-coalition in order to “isolate” the “strategic depth of Shia expansion” in Iraq? This, however, is not the first time an Iraqi politician has accused the US-coalition of dropping weapons and aid to ISIS, this is instead a phenomenon that has been going on for some time now, in one incident two British planes were even shot down by the Iraqi’s under charges that they were dropping weapons to ISIS. Photographic evidence was taken of the downed planes. Iraqi parliamentarian Jome Divan stated that “The international coalition is only an excuse for protecting the ISIL and helping the terrorist group with equipment and weapons. The coalition has not targeted ISIL’s main positions in Iraq.” This being only one of a plethora of Iraqi politicians who have consistently been making these claims for some time now. In any event the spillover to Iraq and the fall of Mosul and Ramadi were predictable consequences of the Wests’ Syria policy, and in some instances it appears as though the West aided in their fall, so at the very least they were an accepted consequence in the strategy against Syria and Iran, and at the worst they were an intended partition of Iraq. Given this, and the fact that the US-coalition continuously aided the sectarian Syrian opposition knowing full well that this would then lead to an “Islamic State”, the consequence of which was the predictable fall of Mosul and Ramadi, coupled with the unbelievable manner in which both fell, it would be wise to consider the numerous Iraqi politicians claims very seriously, and to seriously question whether or not the fall of these cities really does have a more believable, albeit much more sinister, explanation behind them. 1.) International Court of Justice, Advisory Opinion on the Legality of the Threat or Use of Nuclear Weapons (1996), “Dissenting Opinion of Judge Weeramantry,” Chapter III, “Humanitarian Law,” section 10, “Specific rules of the humanitarian laws,” (a) “The prohibition against causing unnecessary suffering” (emphasis in original). 2.) Cockburn, Patrick. “The Rise of ISIS.” The Rise of Islamic State: ISIS and the New Sunni Revolution. Brooklyn, NY: Verso, 2015. 15. Print.